I need you to understand something. 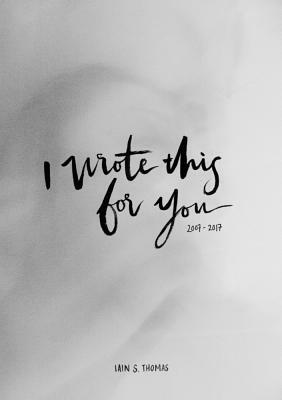 Ten years ago, I started writing this for you. I wrote it for you and only you. Since then, millions of other people have read it, but none have understood it the way you understand it. I set out to find you a long time ago and today, I'm so glad I finally have. Thank you for reading these words. Iain S. Thomas is a new media artist and author. As an author, his most famous work is I Wrote This For You, which he writes under the pseudonym ‘pleasefindthis’ - a blog then book that’s been on poetry bestseller lists. He regularly writes for The Huffington Post and currently lives in South Africa.